Saut-d'Eau falls in the Central Plateau of Haiti is at peril of running dry. Its mouth, Kaara, is not producing enough water to keep the waterfall of Saut-d'Eau at full volume, having declined in its output over the last six months. Simon Desras, President of the Senate, worries if the falls should stop flowing, the economy of the Central Plateau will suffer. The stoppage would damage, not only the economy of the region, but affect a tradition that has taken place at the falls since 1847. In that year, an apparition of the Virgin Mary manifested at the twin falls, beginning an annual pilgrimage to Saut-d'Eau, to bathe beneath the onrushing streams that plunge down the gorge. Upwards of 20,000 bathers visit each year for this sacred rite. The town of Coteaux is the capital of the Arrondisement of Coteaux in Haiti's Sud Department. However, it is not the only reason why many people throng to the town every now and then. A high number of believers often go to the town in order to pray to the Miraculous Virgin in Coteaux. It is believed that the Virgin hears and grants the prayers of believers, especially women. In order to reach the shrine where the Miraculous Virgin can be found, people have to pay a pilgrimage and climb a 500-step stair. Going to the shrine through the long stair is almost the same as scaling the popular Great Wall of China. According to news just received, there has been a major truck accident on Friday, January 25, 2013 in Haiti. A truck coming from Bainet in direction to Anse-à-Foleur lost control and overturned in a canal. More than 50 people were on the truck. It has been reported that 22 passengers who were in a truck carrying pilgrims have lost their lives and another 30 had been injured. The Haitian authorities expect the death toll to increase as several of the those injured were critical and will likely not make it alive. According to police, the truck that was traveling to near the town of Saint-Marc, about some 100km north of the capital, fell into a canal. Many of the victims drowned following the truck accident, some died crushed by the truck. If there is one place in Haiti where tourists may want to visit, it can be the town of Ganthier in the Arrondissement of Croix-des-Bouquets. The town has a lot of great stuff to offer to tourists. It is known for the production of Haiti arts such as crafts, handiworks and others. There is actually a tourist shop where people can buy souvenirs. Tourists are also fond of Ganthier's environs, as well as the l'étang Saumâtre located near by. In addition to the regular tourists flocking the city are the pilgrims who arrive every year. Thousands of natives and pilgrims come to Ganthier to visit a holy site called the Calvaire Miracle. Most of the pilgrims are Catholic and Voodoo followers who pray and wish to get rid of their problems and start a new life. In order to signify the challenges and burden they carry, the pilgrims hold stones over their heads. 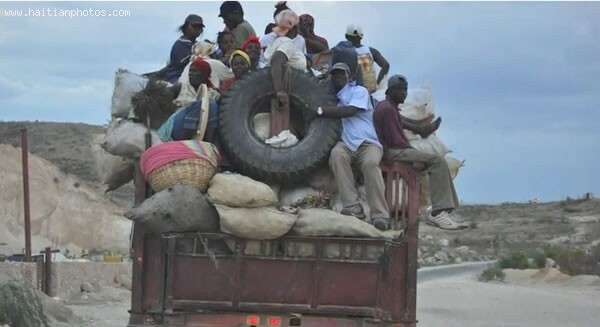 Who would have thought that Haitians could decide to start a pilgrimage or parade by taking a piece of wood from one end of Haiti to the other end, on food and no compensation? Harry Nicolas, nicknamed Mèt Fèy Vèt did. Harry Nicholas the person who came up with the idea of Kita Nago is a true Haitian believer. He is the one who came up with the idea of organizing a movement were Haitians would carry for not less than 700 kilometers from Les Irois to Ouanaminthe. They will be walking across Haiti, from the western tip southern peninsula, all the way to the northeast corner of Haiti. If there is one thing that the Haitian town of Saut-d'Eau in the Centre Department is known for, it is its holiness. Every year, thousands of Haitians go on a pilgrimage in the town to pray and ask for miracles to its patron saint, Lady of Mount Carmel. Saut-d'Eau, whose name means a "happy village," boasts of a couple of historical and mystical heritage sites. One of them is the town's breathtaking waterfall, where the name Saut-d'Eau was actually derived from. The waterfall becomes a hot spot during the annual pilgrimage, as people go to the site and jump into the waters as part of their ritual. Believers from both Catholic and Voodoo religions strip down their clothes and bathe in the waterfall, which is said to have healing powers.